Dolby brings Atmos sound to virtual reality headsets | What Hi-Fi? Dolby is working with virtual reality company Jaunt to bring Dolby Atmos soundtracks to VR headsets for what it hopes will be the next generation of music, movie and gaming experiences. A blog post on the Dolby website has confirmed the surround-sound pioneer is getting involved in the burgeoning virtual-reality market, teaming up with VR company Jaunt on a series of downloadable virtual reality clips. 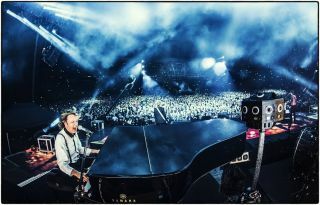 Three VR experiences have been made available on the Jaunt website: Black Mass, a creepy horror flick; Kaiju Fury!, a Godzilla-style monster movie; and Live and Let Die, a video from Sir Paul McCartney’s 2014 concert in San Francisco. The right software on your smartphone (Jaunt recommends the Google Nexus 5, HTC One (M8), LG G3 and Samsung Galaxy S5) and the relatively afforable Google Cardboard VR kit is all you need to experience the videos. VR is all about offering a 360-degree video experience, the action moving with you as you move your head, and it's this aspect that Dolby says perfectly suits the application of its new Atmos surround sound technology. Dolby Atmos started out in cinemas, where as many as 64 speakers can be installed to truly deliver sound from all around you. Now it's available in the home, where up to 34 speakers, or more realistically, a few height channels or in-ceiling speakers, aim to enhance your home cinema experience. You can read all about it in our complete guide to Dolby Atmos in the home. John Couling, senior vice president, E-Media Business Group, Dolby Laboratories, explains why Atmos and VR are a natural fit: "The freedom to look where you want is a key difference between conventional film and cinematic virtual reality. "But that variable point of view also makes precise, moving sound vital. Since the filmmakers can’t control where you’re looking, they have to use sound to direct your attention. Dolby Atmos is perfect for this kind of content. "Dolby Atmos allows filmmakers to precisely place and move sounds anywhere in a scene, including overhead. That means that cinematic VR creators can depend on Dolby Atmos to make sure viewers always know what’s happening - and where it’s happening - in a complex and fascinating environment." With the likes of the HTC Vive VR, Microsoft HoloLens and Samsung Gear VR joining Oculus Rift (now owned by Facebook) in the virtual reality headspace, it makes sense for the big audio companies to get on board to enhance the experience, and Atmos sounds like the perfect fit to us. You can read more about the Dolby and Jaunt collaboration on the Dolby website. MORE: Dolby Atmos at home - What is it? How can you get it?